Poor, overlooked water. It is a vital for cooking pasta, rice, grains and soups, yet most recipes don't even include it in their ingredient list, instead casually mentioning the need to add water in the instructions. (This lovingly-written recipe is a notable exception.) Water is so available, so commonplace, so seemingly endless a resource. After all, what other ingredient flows directly from the kitchen tap, my dream of installing a hot fudge spigot notwithstanding? In Zimbabwe, however, water is no longer taken for granted. Water cuts have been a feature of city life for years, most often caused not by a lack of water in the reservoirs, but by government's lack of foreign currency (or unwillingness to use the currency they have) to purchase treatment chemicals and repair broken pipes. So I was not surprised when, two weeks ago, I returned from a short holiday to find that my house had no water. Problem number 2: while I was away, the motor on my water tank had broken. Usually the tank fills with municipal water and then, when the water cuts off, I turn on the tank's motor and water begins pumping throughout the house. Problem number 3: I quickly learned it wasn't just my neighborhood without water, but the entire metropolitan area of two million people. It was unknown when water would return. One night of no water is not too bad. You can't take a shower, but a little water is left in the toilets. There are a few emergency water bottles on hand and cold drinks in the fridge. Stir-fries or egg dishes are both possible. You can even look on the bright side - no water means that you can slack off on doing dishes and laundry. The next day, I got my water tank fixed, but the repairman also, in a brazen maneuver, removed all of the water - this is how valuable a commodity that water has become. When I got home from work and saw what had happened, I understood why some people believe that conflict over water may spawn the wars of the future. I was furious. And suddenly very, very thirsty. Water was scarce all over town, a town already reeling from a cholera outbreak - where would I get more? It is not ironic that the Spanish word for cholera, cólera, also means rage and anger? Two days of no water is inconvenient. Three days of no water becomes a crisis. I went next door to beg for a few buckets of water from a kind neighbor whose boyfriend owns a water delivery service. Near my office, I saw women with colorful plastic pails jostling for position in a queue outside a property lucky enough to have a functioning borehole (a.k.a. well). During my evening neighborhood walk, a group of professionally-dressed women, fresh from work, dashed across a busy road with cooking pots on their heads, water sloshing over the sides. Women ferrying water is a common sight in rural parts of Zimbabwe, but is something I had never seen in the part of the city where I live. Water is, of course, critical to making sadza, Zimbabwe's staple food. The water did come back after three days, at least in some parts of the city. But many residents didn't notice - they haven't had municipal water for months and months and have come to rely on hand-dug shallow wells. 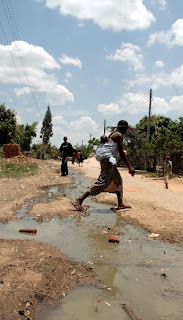 It is not a surprise that cholera has spread through the country, although no less a tragedy. The entirely preventable and treatable disease has already killed more than 1,000 people. The highly contagious bacteria is taking advantage of ideal circumstances - a perfect storm of crumbling water and sanitation infrastructure and a health system that has collapsed due to the lack of medicines and striking nurses and doctors. (I would strike, too, if my monthly salary was $5 as a result of hyperinflation.) Cholera is considered a disease of destitution because it flourishes when there is a complete breakdown of public services. What is it like to live in a city with a cholera epidemic? The first thing you notice is that no one wants to shake hands because it is one of the ways the disease can be spread. The first few days, I noticed aborted handshakes. A colleague would start moving his hand forward and then, suddenly remembering the outbreak, retract his hand, lowering his eyes with embarrassment at having to skip this common courtesy. The new trend is to ball your hand into a fist and touch wrists, or to touch elbows. Next, you hear people talking about cooking their food thoroughly - eating fresh fruits and veggies has become a leap of faith. How many people may have touched this carrot and what if one of them had the cholera bacteria on his or her hands? And, as the number of deaths increases, almost everyone in town now knows someone (or knows someone who knows someone) who has died from the disease. As Christmas approaches, Zimbabweans will begin heading to their rural homes to celebrate with extended family. Others will make the trek to neighboring countries to shop in the well-stocked, reasonably priced supermarkets of South Africa and Botswana. All this movement could further spread the disease. Nevertheless, if there are any people in the world who can still find joy in the holidays, despite the mounting problems facing their country and its people, it is Zimbabweans. They will share food and drink, and somehow find reasons to laugh. Me, I'll be here in Harare and, water permitting, busy cooking and baking. Happy holidays to all! 1) Carolyn's cooking bylaw number 134 -- which states that the longer than expected a dish takes to prepare, the more likely it is to be a complete disaster -- received its most serious challenge to date. 2) I discovered that dried beans do not have to cook in a pot in order to be edible. I was so taken back that the following day I bored at least two people at a brunch by reviewing these discoveries in detail. Now it is your turn. Akara are a snack food from Ghana. You begin by soaking black-eyed peas for a few hours until the skins loosen and, theoretically, can be rubbed off. I soaked and soaked, but some of the beans really required more of a peeling than a rubbing to shed their skin. In my head, I could imagine a group of Ghanaian women sitting in a convivial circle under a shady tree, each with her bowl of black-eyed peas, gossiping about the neighbors and conferring about this year's crops. In this setting, rubbing the skins off of black-eyed peas might be quite a sociable, enjoyable affair. Standing under a naked florescent light bulb for an hour by yourself with a swarm of mosquitoes biting at your ankles is less fun. And every minute that passed, I was thinking to myself, there is no WAY these darn fritters are going to be worth it. The skinned black-eyed peas looked as funny as leopards without their spots. I put the snowy-white beans in the food processor and added a bit of water until I had a paste. I added spices and minced onions and peppers, and began heating oil in a fry pan. It was at this point that I realized -- these beans are only going to cook for a few minutes! Can it be possible? I was convinced, more than ever, that the dish would end in calamity. But, somehow, it worked. The fritters fried up nicely. They were a bit bland -- I'll be more generous with the spices next time -- but it was nothing a little hot sauce couldn't fix. The fitters would be great served in a pita like falafel, or with a side salad. Although the beans themselves aren't very flavorful, they could absorb many interesting flavor combos. Next time, I'll try some curried fritters, or maybe a fresh herb version. That is, once I find someone to sit with me and chat as I skin those beans! There are numerous akara recipes on the Web, all fairly similar. I worked from this one. Rinse peas under running water and then soak them in a bowl of water for a few hours or overnight. After they are soaked, rub them together between your hands to remove their skins. Rinse again to wash the skins away. Drain. Put the beans in a food processor and slowly add water until they turn into a thick paste that will just stick to the back of a spoon. Add onion, salt, chili pepper, and cayenne. Mix well. Ensure the bottom of the pan is covered with oil and set over medium to medium-high heat. Fry spoonfuls of the batter, turning over after a few minutes until each side is golden brown. Is there a mundane life task that, for reasons known only to your subconscious, gives you immense satisfaction? For example, some people are pleased as punch when they can tick items off their to-do list. I know because I am one of them. I also get a strange pleasure from putting leftovers in just the right size Tupperware container. Seriously. And, I love, love, LOVE blending. Something about taking a few flavors that complement each other, giving them a little whizz with the food processor or immersion blender, adding a bit of this or a dash of that, and, of course, consuming the final product…it just fills me with glee. If I ever right a book about food, it will be called Soups, Smoothies, Dips and Other Things You Blend. That’s why, on a Saturday afternoon, I found myself blending together the ingredients for an Ethiopian dish called atar allecha. 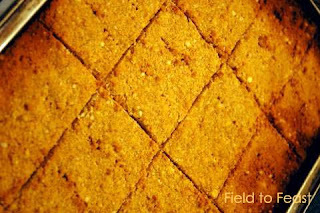 Usually served with injera, I made the mixture a little thicker than the recipe called for, added a squeeze of lemon to brighten the flavors, and served it as a dip. The color is bright green due to the combination of green split peas and turmeric, and the taste is earthly and wholesome, with a spicy kick. What a combo: a blended dip and – tick that to-do list! – a post, too. Now, I just need to find a Tupperware to store these leftovers…. Soak the peas for one hour. Put them in a pot with plenty of water and bring to a boil. Reduce to a simmer, and cook until the peas are soft – about 30 minutes. Drain, reserving the water. Set aside. Heat the oil in a medium saucepan over medium heat. Add the onion and garlic and sauté for five minutes. Add the peas, turmeric, salt, and chili. Mix well. Add ¾ cup of the reserved water, stir and cook for 3-4 minutes. Take off the heat and blend with an immersion blender. Add more reserved water as needed to obtain the dip consistency that you prefer. Add the lemon juice and stir. Serve warm or at room temperature, topped with a light dusting of chili powder. Serve me fresh fish, and I am a happy girl. Serve me fresh fish topped with crispy, stir-friend threads of ginger, squid sautéed with green peppercorns, banana flower salad, and coconut milk and lime smoothies, and, well, I might never leave your country. 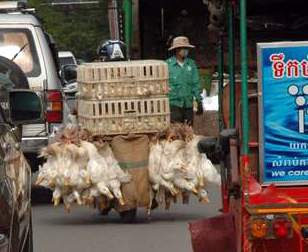 I did leave Cambodia, after one week of work, and one week of holiday. But it was hard. Phnom Penh and Siem Reap - the two cities we visited - are bustling. 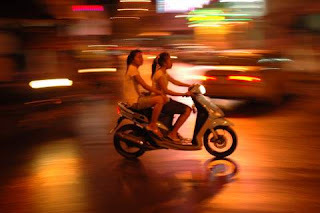 Motos (motorbikes) and tuk-tuks (motos that pull four-seater, covered carriages) zip about, with scarce regard to traffic rules, traffic lights, or pedestrians' toes. Although trials of Khmer Rouge leaders are ongoing, the Cambodians I met were focused more on the future than their country's past. Property prices are skyrocketing; tourism is beginning to flourish. And, of particular importance to me and you - good food is everywhere. Every third storefront seems to be a family restaurant. These home-restaurants often lack English menus - you'll just need to be brave, visit one that is crowded, and order by pointing at what someone else is eating. At night, when the restaurants close, family members fold up the chairs and tables and use the space as both their garage and living room, faces lit by the blue glow of the TV. The local markets are crowded and chaotic, with motos struggling to weave amongst the people and the ground muddy from rain. Squatting women scale and chop fish using a cleaver and a short, circular butcher block. 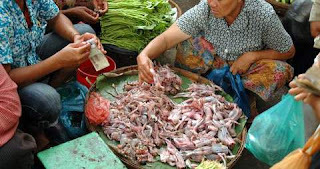 Enormous fish display their guts; slippery black fish squirm around in baskets; skinned frogs attract flies; marinated baby chickens turn on spits. Fruit stalls showcase homely-looking longan, flashy rambutan, the imposing durian, cutely dimpled lychees, smooth-skinned green oranges, and the miraculous mangosteen, which tastes like a concentration of every fruit in one bite. Bicycles and motos trundle street food throughout town - Vietnamese spring rolls; French bread spread with fish paste; tiny snails, boiled and tossed with chili, salt and garlic (very tasty! ); stir-friend noodles; sugar cane juice; and thin pancakes brushed with egg and dusted with Milo. 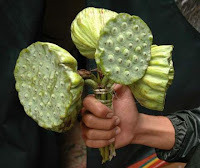 In Siem Reap, the home of Angkor Wat, "bouquets" of matte-green lotus flowers are sold by the side of the road. 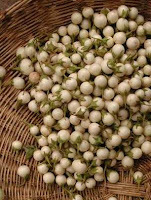 Like, in my opinion, the world's best snacks, lotus flowers take a bit of effort to eat - their edible seeds need to be individually popped out of the flower. These seeds have the texture of slightly under-boiled peanuts and a fresh, lightly-sweet taste reminiscent of edamame. They can also be boiled and roasted. Lotus roots are consumed, too - they add a distinctive crunch to salads. On the road to Banteay Srei, one of the many temple complexes, almost every front yard boasts a little stand/shop/kiosk selling something - usually fabric, handbags, Johnnie Walker Black bottles filled with gasoline, and neat pyramids of boxes made from palm tree leaves and filled with discs of palm sugar. 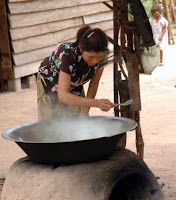 Women tend the stalls while simultaneously watching over a large, wide pot of boiling palm fruit, concocting palm sugar. Some stands also sell palm fruit fresh from the nut - it is squishy and opaque (like a jelly-fish, really) and the size of an egg, with a lychee-like texture, but a disappointingly bland taste. We toured the Psar Salam (Big Market) in Siem Reap, a bit outside the main part of town, as part of a "Cooks in Tuk-Tuks" cooking class offer by the gorgeous River Garden Hotel. I must have asked the chef who accompanied us 150 questions about the mystery foods on display. Cambodia has an amazing variety of eggplants - cream-colored, baby eggplants the size of blueberries (bitter-tasting, they eaten boiled or fresh with fish paste), green and white globe eggplants (grilled and eaten with pork), "bird" eggplants the shape and size of - you guessed it - bird's eggs. We saw caraway leaves, which grow amidst rice fields (they smell just like the seeds), green tomatoes and tamarind flour (used for making sour soup), hot basil and saw mint, cultivated and wild morning glory (also called water spinach), and tiembi (I'm unsure of spelling), which resembles a potato, but can be eaten fresh and tastes like a cross between a potato and an apple. Yellow curry paste, sold from shallow plastic bowls, is made from kaffir lime, lemongrass, galangal, turmeric, and garlic, all pounded together. 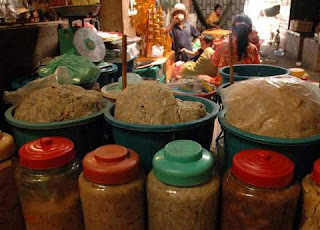 Pickled beans and radishes can be bought in scoops from glass jars, and are used to top morning porridge. Shredded, dried fish is another porridge mix-in - it tastes strangely sweet, like fishy cotton candy. A woman with a pole over her shoulder, hung with two baskets, sold us a fried rice flour cake, powdered in sugar; from another vender we bought a dessert of boiled coconut milk and sticky rice flour, served wrapped in a banana leaf and topped with shredded coconut. If markets aren't your style, there is a fantastic array of restaurants to choose from. In Phnom Penh, one of our favorites was Romdeng, a new restaurant set in a beautifully-restored colonial house garlanded with a green-and-white-striped awning, feeds both your social conscience and your stomach. Romdeng is a project of Friends International, and serves as a training center for former street children. Its dishes are artfully presented, and include such stunners as green mango and smoked fish salad with sun-dried shrimps, fresh river fish with green tamarind and a salsa of green mango and red onion, lime-marinated Mekong fish salad with galangal and saw mint, and red sticky rice porridge with coconut milk and longan. This is also the place to try crispy tarantulas - a Cambodian delicacy - here served with lime and black pepper dip. Nyemo, a restaurant run by an organization that supports women who have been abused, abandoned, trafficked or affected by HIV, serves a fantastic fish amok - one of the most well-known Cambodian dishes. 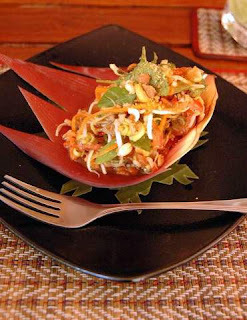 Tender cubes of fish are steamed in a lemony, spicy coconut sauce, and served in a banana leaf basket. Don't go to Nyemo in a rush, however - service is slow! Another yummy choice is Boat Noodle - the one at 8B Street 294 is located in a fantastic old wooden house. The dishes are served in narrow, ceramic "boats", with spicy sauces in the fore and aft. We made two trips to Sakrawa Café restaurant (#12 Street 118, near riverfront), where all the dishes 2.5-6 dollars. Its squid dishes are excellent - try the squid in black pepper sauce, served with julienned green pepper and red chili. Just beware of the bad lite jazz pumping through the loudspeakers.... If you need to duck in from the afternoon rain, like we did, the Tamarind on 31 Street 240 offers half-price drinks from 3-7 and excellent Mediterranean-inspired tapas. We enjoyed two Moroccan dishes – zalouk and chakchouka (without the egg). It would be impossible to mention Cambodian food without talking about prahok - the ubiquitous fish paste. 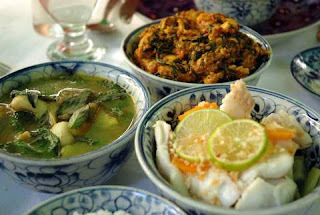 Different varieties of prahok accompany meat, chicken or fish dishes; they can also be used as dips or stirred into soups. By outsiders, prahok is almost universally described as an acquired taste - I echo these sentiments! My husband, who is the only person outside of Australia and the U.K. who actually likes Vegemite and Marmite, was a quick fan, however - prahok shares the same concentrated, powerful, salty, fermented flavor of these spreads. In case you are feeling particularly daring one day, here is a recipe for prahok from the cooking school at The River Garden. The chef said this version of prahok is most commonly eaten with chicken dishes. We ate it as a dip for veggie crudités - long green beans, cucumber and baby eggplant. Chop together all ingredients until it forms a smooth paste. 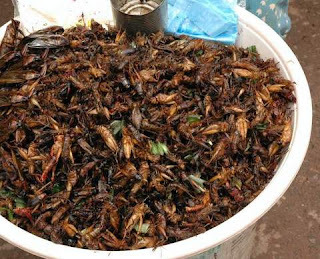 And maybe a few fried cockroaches? Field to Feast has never wrote and posted in situ, but here goes - I am writing to you from the shores of Lake Kivu, in western Rwanda, a 10-minute drive from the border with the DRC. Lake Kivu has the unenviable privilege of being considered one of Africa’s “killer lakes” because of the amount of dissolved methane gas and carbon dioxide at the bottom of the lake – gases that could one day burst to the surface, releasing toxic fumes. On the bright side, the methane is being explored as a source of energy – it has even been used to power the nearby Bralirwa brewery. Today is a little overcast, so the lake and the sky are an almost indistinguishable grey. But, small waves are lapping on the sandy beach and the air is mild, so I am not complaining about the bland view. I had enough spectacular views this morning on the 20-minute drive to some nearby hot springs. The bumpy road wound through hills and valleys of banana grooves, with slices of the lake visible around each bend. Tiny shops lined part of the route – buildings of painted clay, some labeled “café-resto,” others selling phone cards or a small selection of groceries. Homes were scattered on the hillside, some on precarious perches, with tiny dirt paths snaking up to their doorsteps. Men pushed rickety bicycles uphill, loaded down with sugarcane stalks or bananas, and women made steep climbs, carrying huge, gravity-defying baskets of bananas and avocadoes on their heads. Although I’ve been in Rwanda almost a week, I have not been doing as much food research as I should. Yes, I did eat brochettes (kebabs) and chips, with potent chili sauce. And, yes, I have consumed more bananas this week than I’ve had in the past year – fried plantains, bananas boiled with green split peas (amashaza mu gitoke), bananas as breakfast, and bananas as dessert. Beyond brochettes and bananas, I really liked isombe, a cooked mixture of greens, peanut butter, and chopped, baseball-size white eggplants. I’ve also eaten sambaza (sardines) from Lake Kivu (the same ones that are dried and called kapenta in Zimbabwe), and paid homage to the aforementioned brewery, which makes Mitzig and Primus, the most popular local brews. I’m sure there is much more to Rwandan cooking and drinking, however! To be explored in a future trip…hopefully one I which I see the gorillas and drink homemade banana wine. Despite the brevity of my trip, I did want to share with you some Kigali restaurant tips. As a complete coincidence, while searching the internet in the hopes of double-checking some spellings, I discovered that I went to all four restaurants listed in this May 2008 article on Kigali’s best-loved restaurants. Clearly, I was getting good dining-out advice from my colleagues! Chez Lando is an open-air, beer garden-esque place, where I had high hopes of ordering the whole grilled tilapia. They were all out, unfortunately, and it was painful watching the last two orders go to a nearby table; the dish looked stunning, and plenty for two people. I ate the fish brochettes instead – they were a little bland for me and needed a good dose of pili-pili hot sauce! Goat brochettes are supposed to be the restaurant's specialty. Khazana’s ambiance may be over-the-top Bollywood, but the food was, without exaggeration, among the best Indian meals I’ve had at any restaurant. The hearty, deeply-spiced chickpea dhal was my favorite. And I’d never taken a liking to injera – this is, until I ate the injera at Lalibela, an Ethiopian restaurant near the stadium. The shiro wot was fabulous. Even me, who has a mushy bread phobia (one reason I have never been too keen on French toast) was devouring the mushy spots of injera where the shiro had soaked right through. The sun is setting, so I’ll close my post. I’ll be back in Zimbabwe on Monday, learning to cope with the new currency! Like it I do. The recipes in Babula Cooking III (named after the Tshiluba word for a small charcoal stove) come from the kitchens of about two dozen women, and bear cozy, homespun names such as “My Best Gingerbread,” “Crazy Cake”, “Company Pudding,” “2-Minute Mayonnaise,” “Eggplant Supreme,” and “Mother Merle’s Corn Soup.” But Babula Cooking is more than an Africanized Garden Club cookbook – it is also a survival guide for wives and mothers far from supermarkets and reliable refrigeration. It contains handy tips for improving the taste of powdered milk (add vanilla and a pinch of salt), keeping (or getting) bugs out of dry goods like flour, rice and beans, and preserving meat through canning and corning. And the recipes themselves speak to these women’s amazing flexibility to devise substitutions and re-create the smells and tastes of home. Lack ketchup? Try puréed tomatoes with sugar and vinegar. Don’t have garlic? “From the forest come leaves and bark with a very pungent odor quite like garlic. [The locals] mix crushed leaves or powdered bark with red pepper and salt.” Here, in the jungle of Zaire, missionary women prepare gravy with palm oil, employ dioshe, a common squash, in “pumpkin” bread, and use papayas to make jam “almost like peach jam.” Meri-meri (a local berry) are the sweetly tart secret in muffins, cobblers and jelly, while mangoes fill in for apples in cobbler, pie, sauce and butter. In a display of thrift, leftover oatmeal and rice get transformed into muffins, and eggplant is grated, browed and mixed with ground meat as a “meat stretcher.” “Philadelphia cream cheese” is concocted with drained yogurt. This, the third edition of Babula Cooking, was published in 1985. In the foreword, the editors write: “Our hope is that we become less dependent on the expensive imported foods and simplify our lives as we live among those who have so much less than we.” In the era of food miles and food riots, it is a message for us all. So, instead of having my mom send me a care package of graham crackers, I tried out Janette Fulton’s homemade version. I found it hard to roll the dough thin enough, so they didn’t have the right crunch, and the texture was a bit too crumbly…but the taste? Well, I’ll be darned if they didn’t taste like the real deal. Preheat oven to 425°F / 220°C. Stir all ingredients together until well-blended. Roll out on two lightly oiled cookie sheets. Score, prick, and bake for 8-10 minutes. Cut apart while hot. Cool and store in tin with tight top. I ended my last post with a wish that the flicker of hope I saw in the days after the 29 March election would reignite. I was wrong, however, to assume the flame had disappeared. It remained a smolder low to the ground, tended by brave people, despite the boots and sticks and metal rods trying to snuff it out. Yes, blogging about food still seems trivial to me. But, it also seems like something I need to do to take a mental break from thinking about the situation here. So, after two months, with this post, I am back! I’ll be consciously avoiding any discussion about the political or humanitarian situation here (which you can read about here, here and here), mostly for my own sanity. So today, I will tell you only one thing about Zimbabwe – a story about the country’s indigenous nyimo bean. Nyimo bean is the local name for the Bambara groundnut, a legume considered an underutilized, “lost crop of Africa,” because it is little known outside of the continent. 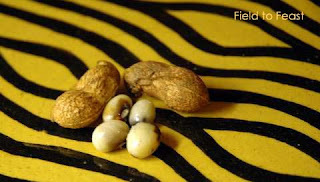 Even in Africa, the Bambara groundnut is often thought of as a “poor person’s” crop and is eclipsed in popularity by its botanical cousin, the peanut, who arrived 400 years ago from Brazil and is now an important source of nutrition in more than 30 African countries, including Zimbabwe. Interestingly, both Bambara groundnuts and peanuts were brought to North America from Africa during the slave trade – there are references to both beans in the diaries of the colonialists. But, once again, the peanut outshone its kin. I bet, though, if you live in the U.S. state of Georgia, you might just be able to find someone still growing the Bambara groundnut. Let me know if you do! Despite being repeatedly overshadowed, the humble nyimo bean still has its staunch admirers – those who respect its nutritional might (this bean is 20 percent protein! 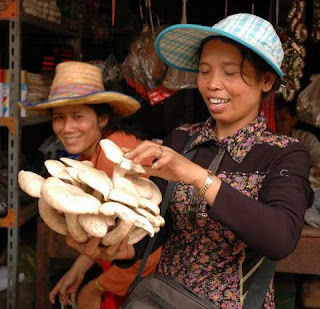 ), its ability to thrive under harsh conditions, and its addictively earthy flavor. Zimbabwe itself gave birth to “BamNet,” the International Bambara Groundnut Network, in 1995. Here, Tulimara cans nyimo beans for sale in some supermarkets. These work well in soups, or for making “African” hummus. Near the end of the rainy season, you can buy dried nyimo beans by the side of the road in rural areas, or from the vendors who ply busy downtown intersections. They are easy to mistake for peanuts, which have the same brown, fibrous shell. The main difference is that the nyimo bean’s shell is rounder – it was not blessed with the peanut’s hourglass curves. You can prepare dried nyimo beans in several ways. What I do is boil them in their shell in heavily salted water under tender (about 30-40 minutes), drain, salt again, and serve. A bowl of beans with a nice cold pilsner are a perfect game-time snack. Just don’t get too scared when you crack open the shell – boiled nyimos do eerily resemble eyeballs! Like peanuts, nyimo beans will absorb flavor through their shell while boiling, so you could add soy sauce and star anise to the water, for example, if you want more complex tastes. Boiled nyimo beans can also be roasted. And, they can be pounded into flour, either after boiling or after both boiling and roasting. This flour can be stirred into maize meal porridge. I’ve read that in Nigeria, women use the flour to make pancakes. Now, I realize most of you readers are a long way away from the nearest Bambara groundnut! What learning about this little legume made me think about, however, are the many fruits and vegetables in our midst that might have been shoved aside by history – maybe because they didn’t keep as well during transport, looked ugly canned, had a unappealing name, or got a reputation as second-class food. They all might be worth a second look.